Title, meta-title, meta-description and keywords are always available since they are stored directly inside NodesSources entity. Then you will be sure to always have a title no matter the node-type you are using. This following fields stores simple data in your custom node-source database table. Single geographic coordinates field stores its data in JSON format. Make sure you don’t have manually writen data in its input field. To use Single geographic coordinates you must create a Google API Console account with Maps API v3 activated. Then, create a Browser key and paste it in “Google Client ID” parameter in Roadiz settings to enable geographic node-type fields. If you didn’t do it, a simple text input will be display instead of Roadiz Map Widget. Virtual types do not really store data in node-source table. They display custom widgets in your editing page to link documents, nodes or custom-forms with your node-source. Children node field type is a special virtual field that will display a custom node-tree inside your editing page. 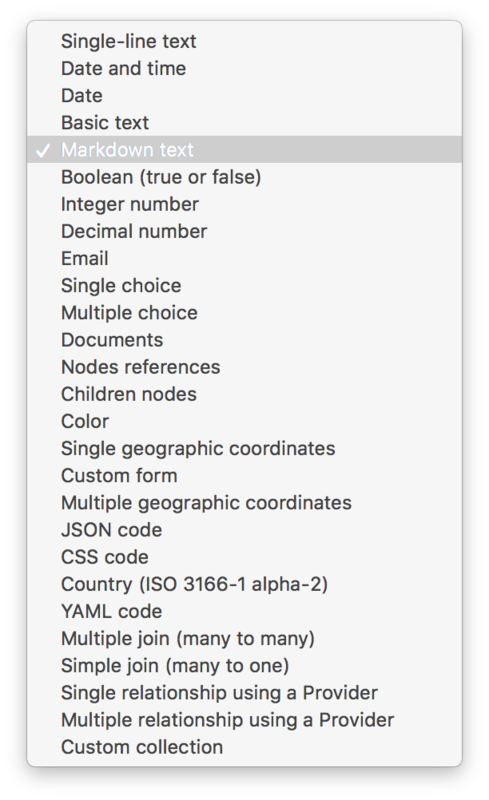 You can add quick-create buttons by listing your node-types names in default values input, comma separated. If you need a field to hold exactly the same data for all translations, you can set it as universal. For example for documents, numeric and boolean data that do not change from one language to another. It will duplicate data at each save time from default translation to others. It will also hide the edit field from non-default translation to avoid confusion. When you use YAML field type, you get an additional method to return your code already parsed. If your field is named data, your methods will be generated in your NSEntity as getData() and getDataAsObject(). getData() method will return your YAML code as string. getDataAsObject() will return a mixed data,array or stdObject according to your code formatting. This method will throw a \Symfony\Component\Yaml\Exception\ParseException if your YAML code is not valid. You can create custom relations between your node-source and whatever Doctrine entities in Roadiz or in your theme. You must fill the default values field for these two types. The generic provider type allow you to fetch every data you want through a Provider class in your theme. This can be really useful if you need to fetch items from an external API and to reference them in your nodes-sources. This provider will implement getItems, getItemsById and other methods from ExplorerProviderInterface in order to be able to display your Instagram posts in Roadiz explorer widget and to find your selected items back. Each Instagram post will be wrapped in a Themes\Rozier\Explorer\AbstractExplorerItem that will map your custom data to the right fields to be showed in Roadiz back-office. You’ll find an implementation example in Roadiz with Themes\Rozier\Explorer\SettingsProvider and Themes\Rozier\Explorer\SettingExplorerItem. These classes do not fetch data from an API but from your database using EntityListManager. Single and multiple provider types can accept additional options too. If you want to make your provider configurable at runtime you can pass options in your field configuration. Then you must override your provider’ configureOptions method to add which options are allowed. Last but not least, you can create a custom collection field to store read-only data using a dedicated Symfony AbstractType. You must understand that custom collection data will be stored as JSON array in your database. So you won’t be able to query your node-source using this data. In your FooBarType, you’ll be able to use Symfony standard fields types and Roadiz non-virtual fields too such as MarkdownType, JsonType, YamlType.